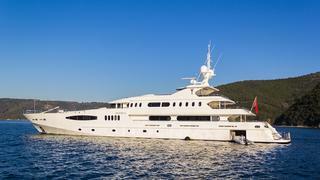 The 58 metre motor yacht Egeria has been sold with Ocean Partners International acting for the buyer and seller. Built in steel by Turkish yard Egeria Yachts to RINA class, she was launched in July 2012 and has a contemporary interior with American walnut wood paneling, leather and glass insets and Swarovski lighting. A unique feature is that all lighting and blinds are controlled by iPad. Accommodation is for 12 guests in six cabins consisting of a main deck master suite, a full beam VIP suite, three doubles and a twin, all with entertainment centres and en suite bathroom facilities. In addition, there is a staff cabin for a bodyguard or nanny. The saloon is vast and has a lounge area with seating on settees and armchairs, a bar and an entertainment centre including a large television screen on a rise and fall system, plus a formal dining area with seating for 12 guests. More casual outdoor relaxation areas are available on the aft deck, upper deck and foredeck. The sun deck is suitably spacious and hosts a Jacuzzi tub and a shaded bar with fridge, along with dining and sunbathing areas. Special features include a fully equipped gymnasium and sauna on the bridge deck, a large swim platform, a touch and go heli pad and a tender garage with doors that open out to port and starboard aft. Twin 2,158hp Mitsubishi engines give her a range of 5,000 nautical miles. Egeria was asking €25 million and will now be available for charter through Ocean Partners International.